In your hirdai, in your heart, vasaa-iho, enshrine, embed the name, the Naam of Waheguru. And then what will you be able to do? ghar baithay guroo Dhi-aa-iho, ghar baithay, sitting within your ghar, baithay means to sit, ghar means your home, sitting within your home you can Dhi-aa-iho, you can meditate upon the Guru. You don’t need to go into the jungles. You can meditate upon the Guru within your own house. This has a double meaning as well. The spiritual meaning is that nothing is outside. Nothing is in this material jungle around us. Everything is within us, within our soul. 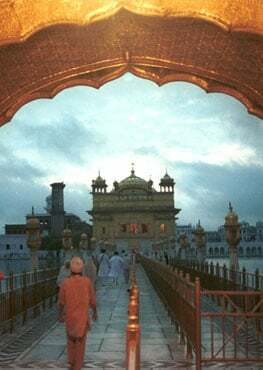 The Guru who is poora, who is perfect, sach kahi-aa has spoken the sach, the truth; so sukh saachaa lahi-aa, and that truth, that sukh, that peace from that truth, is only found from the sacha, the Waheguru, who is the true One, who is the Sat Naam. apunaa means my own, gur means Guru, miharavaanaa means merciful, hoeiou means become, my Guru has become merciful upon me; anadh sookh kaliaan ma(n)gal sio ghar aaeae kar eisanaanaa, Guru ji has blessed me with anadh, with bliss, with sookh, with eternal peace, with kaliaan, with pleasure, with mangal, with the joy of all joys; ghar aaeae, and I have returned back into my true home, into my soul; kar eisanaanaa, after I have done eisanaan, after I had my purifying bath in the name of God; rehaao, Guru ji says, Pause and think about this. The vaddiaaee, the greatness of the Guru is saachee, is forever true; thaa kee keemath kehan n jaaee, the keemath, the birth of that vaddiaaee of the Guru, kehan n jaaee, cannot be described. The Guru is the paathisaahaa, the king of all kings; gur bhaettath man oumaahaa, I am meeting the Guru, bhaettath means to meet, gur means guru, man means mind, oumaahaa means to be in joy, meeting the Guru, the mind goes into supreme ecstasy. All paraashhath, all sins, sagal means all, laathhae means to be taken away, mil saadhhasa(n)gath kai saathhae, by meeting with the saadh sangat, saathhae means company, by meeting up with the saadh sangat, all sins are washed. The hari naamaa, the name of Waheguru is the nidhhaan, is the treasure of all gun, all virtues; jap pooran hoeae kaamaa, and by meditating, by jap, by repeating the Naam, What happens? pooran hoeae kaamaa, all your affairs, all your kaama, all the jobs which you need to get done, all your works are pooran hoeae, are resolved perfectly. The Guru has keeno, has opened the mukath dhuaaraa, the door to liberation through the shabad, sabh srisatt karai jaikaaraa, and the whole world, sabh means all, srisatt means world, the whole world jaikaaraa, sings the victory, sings the chants of the Guru. Oh Nanak, prabh, Waheguru is maerai saathhae, is always with me at all times; janam maran bhai laathhae, and because I have realized that the Guru is with me at all times, janam maran bhai laathhae, the bhai, the fear of janam, birth and maran, death has been taken away. Guru Arjan Dev ji said when he was sitting on the hot plate, Gur mere sang sadha hai nale, simar simar this sadha samale, I realize that the Guru is with me at all times, Waheguru is with me at all times, and therefore I don’t worry because my Guru will look after me at all times. Even on the hot burning plate Guru ji had this understanding. So Guru Sahib is saying to us, Meet with the Guru and meditate on Waheguru and you will not need to search anywhere else. The Hukam overall is referring a little bit to something that Guru Nanak talks about in Japji Sahib. Guru Nanak says that there is a sacred bathing place deep within us and when we wash ourselves in that place inside of us, tha’ts where we find our purity, that’s where we find our real identity, that’s where we find the experience of the divine. hirdai naam vasaa-iho. ghar baithay guroo Dhi-aa-iho. gur poorai sach kahi-aa. so sukh saachaa lahi-aa . So what Guru Arjun is saying is that the experience of the divine identity is inside of your own heart and that you can live in that place of the divine inside of you. By sitting in your own home, meditate upon the sound of wisdom that guides you to truth, to the Guru. This Guru, our Shabad Guru is absolutely perfect and it talks about Saach. It talks about truth. Saach can also be referenced as Saachkhand in Japji Sahib where Saach is really the ultimate reality where the formless one is watching everything and dwelling. In the phase of watching it protects and guides all of the actions. So meditation on the Guru brings us to Saach. It is bringing us to an awareness of that ultimate reality which we are a part of and which we can experience in life and merge into after death. So through that understanding of Saach we can experience peace here in our lives. So, in these lines Guru Arjun is saying, I have done this ishnaan in my own heart and in my own home. I have taken this purifying bath and this is the reference back to the Japji Sahib: finding that the water is inside of yourself in which we bathe and purify ourselves. Through the kindness of the Guru we experience bliss, we experience peace, we experience joy, we experience total happiness, after having taken this kind of purifying bath. So this Guru of ours is really great. The Guru is related to the Ultimate Truth and is really great in the way it guides us. taa kee keemat kahan na jaa-ee. sir saahaa paatisaahaa. Guru Arjun keeps talking about the greatness of the Guru that gives us this gift saying that there is no way to describe the value of the Guru. This Guru is the king of all kings. When we get to be in relationship with the Guru then the mind really becomes something very beautiful. Rather than something that pulls us one way or another, the mind becomes enthralled with the play of the divine. It sees the play of the divine and how wonderful that becomes. In that state there are all these gifts such as sagal paraachhat laathay, mil saaDhsangat kai saathay. All of our dysfunctions are just cleansed when the mind becomes enthralled with the Guru and the vision that the Guru shows us. When we are with the SadhSangat, the people who are also doing this practice, we bring it to an even greater experience for ourselves. The virtues of the divine and the divine identity inside of us is a treasure. When we continually meditate, chant, repeat and be in this practice then everything, all of our actions are resolved in a very perfect way. So the Guru is saying that there is no reason for us to do effort, we just have to practise Jap and through the practice of Jap in itself has to power to perfect and arrange all of our affairs. This sound of wisdom, this Guru that we have, guides us and opens up the door of liberation that is within us, inside of us. This is again another reference to Japji Sahib where Guru Nanak talks about the human body being a gift because the gate of liberation is found inside of it. When we get that experience then the whole world is there really cheering us and applauding us that by Grace that there is a soul that realised gift of the human birth and has embraced it and lives it. Nanak is saying that the transcendent lord, that transcendent divinity is always with me. I am in that state of feeling the divine with me always then the fear of birth and death, they just go.